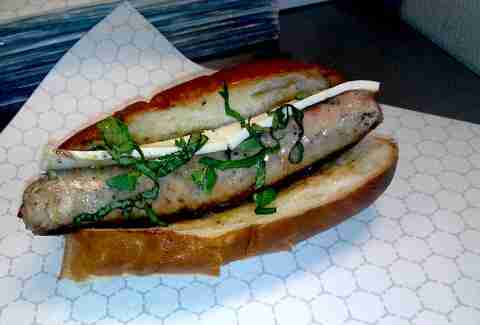 You don't have to be a Sausage King of Chicago to know that Chi has a shload of great link options, both old and new. You do, however, have to be a Men's Interest Website King of Chicago to identify which nine are the absolute best. 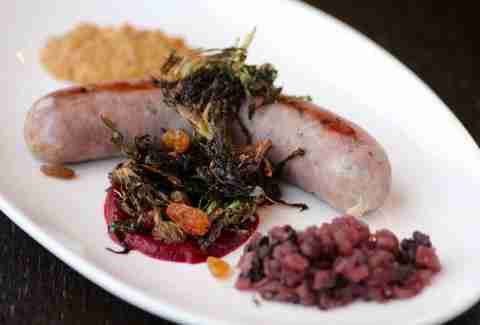 To wit, here're our (and probably Abe Froman's) nine favorite sausages in Chicago. 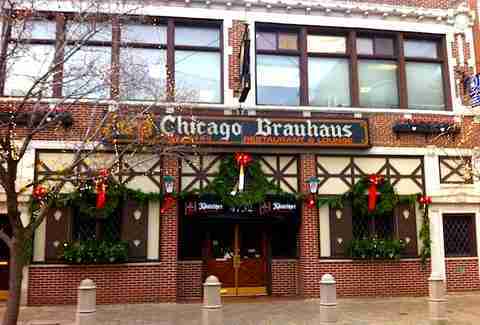 Obviously the best beer sausage in Chicago resides in a place with growler light fixtures. 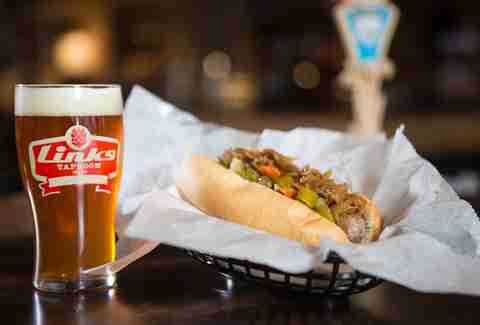 Link's Chicago Steak & Ale consists of simmering a sirloin dog in Bell's Amber, then awesomely topping the thing with bacon and horseradish. 75 years after firing up the grill, Jim's Original is still doling out smoked Polish sausages dressed exactly like they were in the '40s... back when men were men and women... um, weren't. Proving you don't need to be 75yrs-old to make a great sausage, The Radler... makes a great sausage: their Thüringer Rostbratwurst, with hard-cooked egg, pickled celery root vinaigrette, fried-potato puree, and spicy mustard. Side liter of beer optional (Editor's Note: ... but not really). 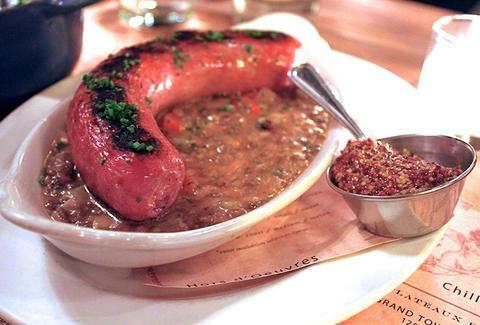 Their specialty dogs are all incredible, but the Bourbon Bacon might be the incredible-est of the bunch: a French-style farmhouse sausage with bourbon and maple syrup. 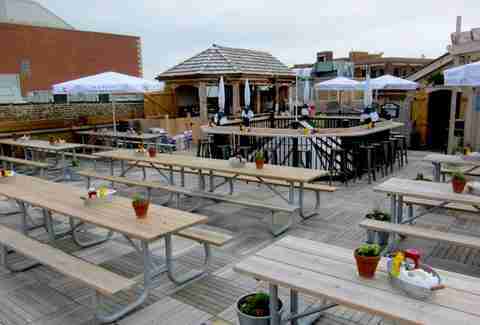 The rooftop beer garden'll return when (if?) it gets warm, and with it, the bratwurst plate -- a massive undertaking with a choice of two sides and a bratwurst you can do any of seven ways (Gene’s homemade, traditional German, Chicago-style, Sheboygan, mushroom Swiss, jalepeño, or apple)... but will do the Sheboygan way. Brauhaus has a knack (!) 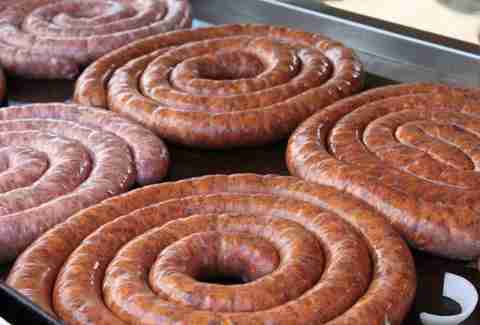 for making short, plump wieners, as illustrated by their titular Knackwurst, a pork and beef link that's just the right amount of spicy and smokey. You can't beat the price ($4.50 for 9in), or the fact that they make all their own sausages, or the fact that this tiny, Italian specialty grocer's Hot Italian is just really, really, really good. Pro tip: load up on some Italian meats and cheeses so you can have another feast when you get home. Oh, this? It's just your average, everyday turkey & date sausage with crispy duck confit, herb/garlic aioli, pickled onion relish & pickled carrots. Nothing to see here people, nothing to see here. 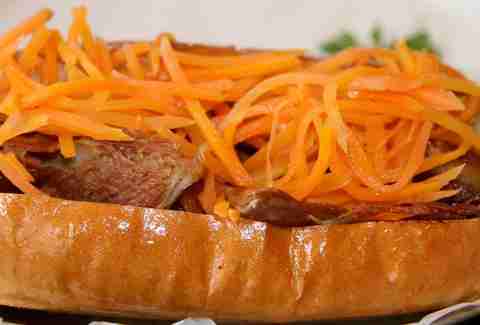 Sausages are great on their own, but they're even better when they're lovingly paired with a pile of moist, flavor-packed, Italian beef. 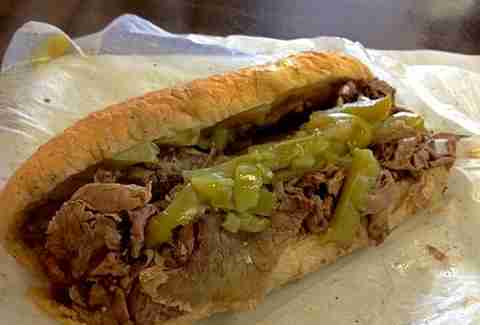 Are you getting it piled with sweet & hot peppers? Of COURSE you are. Grant Marek is a Senior Editor at Thrillist, and changed his fantasy football team name to "The Abe Fromans" two years ago. He has been to the finals each of the last two years. Coincidence??? We think not. Follow him @Grant_Marek.